Let’s travel to the Guna culture to explore the theme of natality by focusing on ‘becoming’ – the development of personhood. The Guna people inhabit Guna Yala, an indigenous province that includes the San Blas archipelago in southwest Panama (see Map). Language. The daily spoken language is Dulegaya, which belongs to the Chibchan family of languages. Because Spanish is widely used in education and written documents, Dulegaya is considered an endangered language. In 2004, the Guna Congress began the process of creating a standard orthography and writing systems for the Guna language (Price, 2005, p.170). I use the preferred and legally recognized spelling of Guna; however, most scholars use Kuna or Cuna. History. Beginning in 1919, the government of Panama instituted policies aimed at destroying Guna culture, including edicts to prevent Guna women from wearing their traditional mola costume and requiring them to adopt Western style clothing. For the Guna, this policy was ethnocide because their molas represent their traditional identity. The Guna Revolution in 1925 led to the recognition of Guna Yala as a semi-autonomous territory within Panama. Today Guna women proudly wear their mola blouses as a “signifier of political resistance” (Marks, 2014, p.17). Using participatory democracy, each local congresio (community) is responsible for maintaining balance and harmony within the ecosystems of its marine and land territory. In this self-governance model, 51 congresios participate directly in the General Congress, which has stood firm in disallowing foreign investment. Consequently, there are no mines, luxury hotels or plantations. The territory of each community includes land, forest, coast and coral islands to allow for protection of interdependent ecosystems. Traditional practices use marine areas for fishing, old forests for hunting and gathering, young forests for fire/fallow agriculture, and spirit sanctuaries for sacred activities and gathering medicines. The Guna socio-cultural governance system can be traced back to the beginning of Guna oral history. Collective memories are applied to make decisions and facilitate engagement in a world of interconnected beings, using time-tested protocols for fostering dialogue (Apgar et al, 2011). EcoCulture. The Guna have a long history of living in harmony with the land; they engage with the spirits of nature through visual arts. Basket-weaving and wood sculptures are art forms integral to their relationship with nature. Nuchukana (wood sculpting) by shamans helps them diagnose, prevent and transform illness by mediating with nature spirits, including ancestor spirits (Fortis, 2013, p.2). Molas – the hand-sewn panels on the front and back of women’s blouses – are a spiritual art form that expresses personhood. The Guna indigenous culture has a population of approximately 40,000 people. Guna families are matricentric with the mother as central to each family and the keeper of the hut because a mother must always have shelter. Sons move out when they marry to become part of the bride’s family and take the surname of the bride. Climate change is affecting the Guna. After abnormally high tides in 2008, hundreds were forced to move inland when their homes were destroyed by floodwaters. The Guna are concerned that their islands will be completely submerged in the near future. Through participatory democracy, they have demonstrated significant strength in adapting to rising sea levels and protecting biodiversity while enhancing well-being. In 2013, the Guna Yala Congress declined a corporate proposal for carbon trading under the “reducing emissions from deforestation and forest degradation” (REDD) mechanism negotiated by the United Nations Framework Convention on Climate Change (UNFCCC). They declined the proposal because it would have been a rejection of their ancestral inheritance: “Because the land is ours. We are bound and obliged to leave it for perpetual use. REDD would have been a betrayal for the long-term, with many consequences – cultural ones, but even more, our possibility to be a people, to be a nation. It would have been the end of us as a people” (Bell & Field, 2013, np). A montage of daily life in Guna Yala (San Blas Islands) off the coast of Panama. In the Guna creation myth, Baba Dummad (Big Father) and Nana Dummad (Big Mother) are a unity, a creative pair. They created the earth, a joy for all beings, and for the plants and animals that live on her. At the very end, they created Olodule (gold humans). It is inconceivable to the Guna that a father could create without a mother. The Guna view themselves as children of Mother Earth: “Mother Earth does not belong to us. We belong to her because she has brought us forth; therefore, we have to share her fruits with all her children – humans and animals. Sharing is important because…we are all brothers and sisters” (Olowaili, p.81). This conviction compels Guna to live in harmony with all living and soulful beings – beings that include ancestors, animals, plants, stones, rivers, wind, sky, earth, sea and many spirits. Nothing exists separately; each being has a place and is a part of the great whole (Fortis, 2013, p.43). The matricentric social structure of Guna culture mirrors this relationship to Mother Earth. Guna mythology provides two principles for maintaining strong boundaries: aggression is a wall of protection around the perimeter of the community in order to protect the birthing / nurturing mother principle at the centre of the community. The Guna believe that if these principles become reversed, it will destroy the relationships that bind the community together and make them vulnerable to external influences at their perimeter, resulting in unspeakable suffering. They recognize that the disease of reversed principles has already infected much of the world, causing great suffering and disrespect to the formerly beloved mother who embodies beauty and culture, as well as natural catastrophes. “A worldview that centres around the mother is, therefore, not a philosophy of women but a philosophy of life. With the Kuna, this is propagated by men. It is a mystery of life that views a fertile nature and motherhood as the basis of our lives and wishes to live in harmony with both.” A Guna shaman, said, “A people who honours nature also honours its women and protects them” (Olowaili, p.90). Guna culture is rich in ritual and ceremony. Making a mola (pl. molkana or molas) is a ritual. Guna ceremonies include ritual chants to celebrate births, deaths and healing of the sick. Ritual chants often have two parts to show the interconnectedness of the natural world and the cosmos. Ceremonies include a needle ceremony in which a baby girl’s nose is pierced for a gold nose ring; a puberty short rite for girls that lasts one or two days; and a puberty long ceremony to celebrate the ritual cutting of a girl’s hair and the assignment of her Guna name. Guna women are the bearers of the culture. 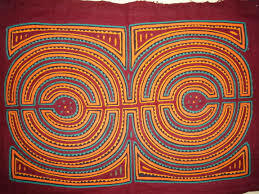 The molas sewn by Guna women are like a ritual chant with the two sides of the fabric forming an integrated design that symbolizes Guna cosmology. Every mola has symbolical significance with motifs created through colour and texture to tell a story about a person in community with nature. The labyrinth is a common motif because it reflects the Guna belief that humans, tropical vegetation and animals are reunited constantly through complex paths. Guna women proudly wear their mola blouses as a sign of their collective political agency to protect their culture in the Guna Revolution of 1925. In the evenings, the community meets in the onmaked nega (central gathering house) for rituals and ceremonies led by the Saila (community spiritual leader) who has memorized saklas (songs) and caciques (chants) in the ancient Guna language. The saklas and caciques relate the sacred history of the people, and the Saila’s recitations are followed by an explanation from one of the voceros (interpreters) in everyday Guna language. The chants are organized in stanzas and repetitions accompanied by slight changes in words, sounds, or meaning. These traditional songs, steeped in myths and symbols, acknowledge the ancestors, praise the land and the sea. The onmaked nega is a critical institution for sustaining Guna traditions, collective memories and language. By preserving and protecting these cultural elements, the Guna achieve freedom to communicate to the outer world the knowledge of who they are. Guna women wear molas every day of their lives and are even buried in them. 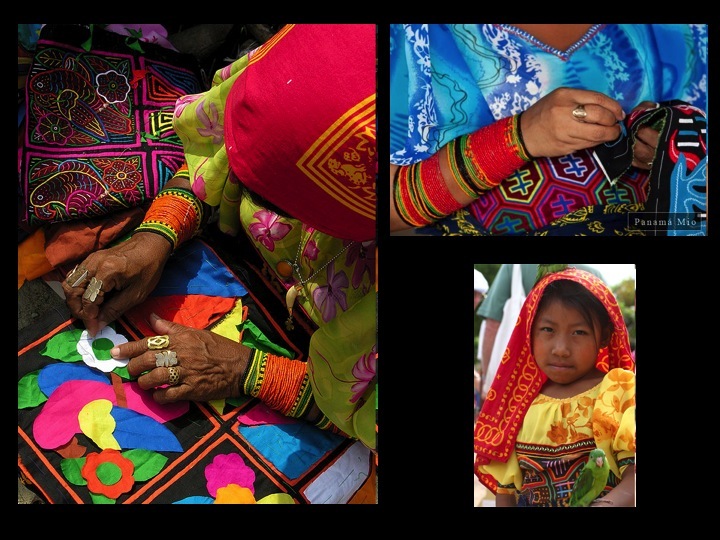 The mola originated with the tradition of Guna women painting their bodies with geometrical designs, using available natural colours. Now those designs are sewn into their clothing. No two molkana are the same. 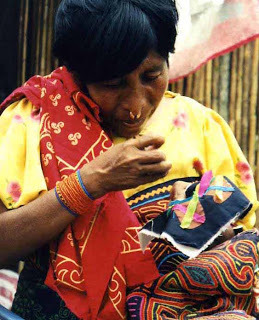 Molas are handmade using a reverse appliqué technique. The skill to make an outstanding mola is a source of status among Guna women. The quality of a mola is determined by the number of layers, colour combination, fineness of the stitching, evenness and width of cut-outs, and details such as zigzag borders, lattice-work or embroidery. A complex mola may require up to 6 months of effort. Fortis links the design of molas to the Guna concept of personhood and collective identity. Because their collective identity is integrated with the plant and animal life that share their territory, a mola represents the biocultural diversity of the Guna. The Guna concept of narmakkalet (design) is central to its definition of personhood. Design and bodies are born together; they are fundamentally inseparable. Design not only contributes to fabricating the body, it also enables the body to be made human. An analysis of kurkin narmakkalet (amniotic designs) on the heads of neonates is the first form of communication between babies and animals, and between babies and adults. This first image forms the basis for the creation of a baby’s future subjectivity (Fortis, 2010, p.480f). Fortis asserts that kurkin narmakkalet is the praxis of rendering visible the inner personhood as well as relationships with the cosmos. Designs are the visual manifestation of the interactive capacity of human beings, animals, and other cosmic entities. To be seen is already to enter into the affective and nurturing dimension of human social life; not to be seen is to remain ‘turned inward’ and requires an additional effort by a shaman to make visible the design which was invisible at birth, and thus to create equilibrium between the cosmic and the social forces (Fortis, 2010, p.492). ‘Beauty’ means to show designs at birth and to develop one’s capacities in concordance with the design. Kuna people are described by what they do, and the social perception of a person is intimately linked to what a person performs best in everyday life. “Preparing plant medicines, cooking food, carving canoes, weaving baskets, performing ritual and mythic chants, fishing, gardening, sewing molakana are all highly valued praxis within the Kuna lived world and are intimately related to one’s own kurkin”. Guna people think of different forms of design, such as mola, beadwork, baskets, as “different manifestations of the same principle, which puts emphasis on rendering visible one’s personal identity and capacities” (Fortis, 2010, p.480). Fortis found that design is intrinsically related to the body in Guna culture. The concept of design is grounded in embodiment and illustrates relationality between inside and outside, between human body and biocultural community (Fortis, 2010, p.491). Through transculturation, design was transferred from body painting to textiles. In summary, the theme of natality is expressed in molas which represent becoming a person in relationship to the cosmos. Personhood is a human right for which the Guna fought the 1925 Guna Revolution – a revolution that illustrates Arendt’s radical notion of political personhood, where not just the person, but also a collective group, is the source of rights. Dissidence is critical to the politics of human rights where the human-rights of sub-altern groups are erased by colonizing policies. The Guna are an endogenous community with aggressive boundaries that protect their core values of personhood, matriculture, biocultural diversity and participatory democracy.